How Do You Find the Volume of a Composite Figure? Composite figures are just a combination of simpler figures in disguise! In this tutorial, you'll see how to break down a composite figure into simpler figures. Then, see how to find the volume of each of those individual figures to find the volume of the entire composite figure. Watch the whole process in this tutorial! A rectangle is one of the many fundamental shapes you'll see in math. Rectangles have special properties that can be very useful in helping you solve a problem. This tutorial introduces you to rectangles and explains their interesting qualities! What is a Composite Figure? Ever notice that some figures look like a combination of multiple other figures? These types of figures are called composite figures. This tutorial introduces you to composite figures and shows you how to break up a composite figure into multiple shapes. Take a look! What is the Formula for the Volume of a Prism? Trying to find the volume of a prism? 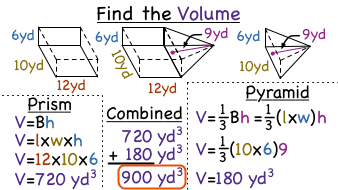 Did you know that there's a formula to find that volume? In this tutorial, you'll learn about the formula for the volume of a prism. Check it out! What is the Formula for the Volume of a Pyramid? Looking for the formula for the volume of a pyramid? Then check out this tutorial! You'll learn about the formula for the volume of a pyramid and see how to use the formula in an example. Take a look! The volume of a cylinder is the amount of space that will fit inside it. You can use the formula for the volume of a cylinder to find that amount! In this tutorial, see how to use that formula and the radius and height of the cylinder to find the volume. Check it out!